Moving house in May has meant my childhood belongings, stranded in an unboarded loft for over a quarter of a century, are now accessible at last. As Christmas approaches and the thoughts of many turn to giving or receiving toys, it feels a like a good time to begin posting on the toys I played with as I rediscover them nearly fifty years on. 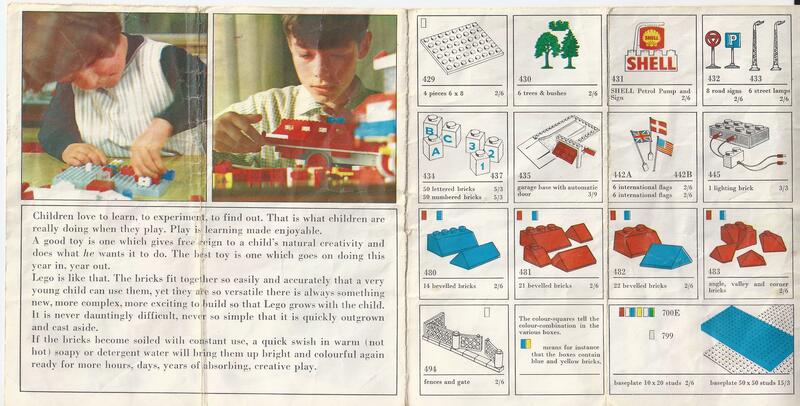 Happily, along with the familiar bricks was some helpful publicity heralding the new set available in autumn 1970. I was six in April 1970. That sounds about right. 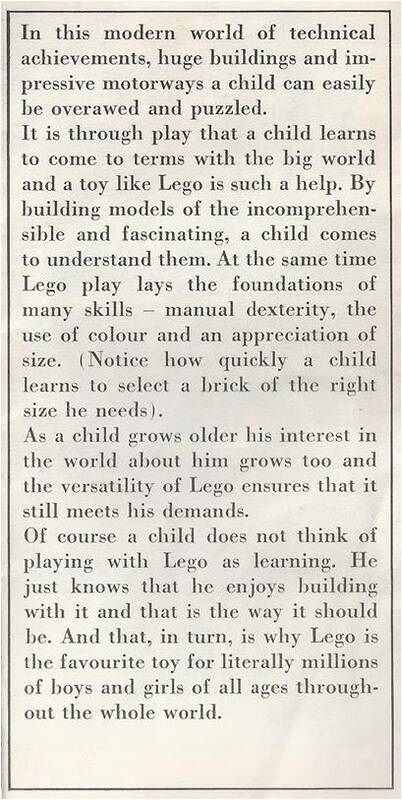 I was never the most dextrous of children and not at all mechanically minded but Lego I liked. My best friend was much more on trend as he had Fischertechnik, a German product founded in 1965 which seems to have reached US and European saturation by 1970. Fischertechnik was much more about engineering and motorization. But I never formed a vision of what a Fishertechniik world might look like, there was no aesthetic grand design that I could see. You needed to have a basic interest in mechanics to engage with it. The appeal of Lego was less the construction aspect per se, more my nascent town planner’s instinct to create my very own Trumpton in the brightest of bright primary colours (blue pitched roofs, trucks in chequered yellow and black, platform lawns in radiant green and red pretty much everywhere else) then populate it somewhat bizarrely with plastic farmyard animals and my few Matchbox cars. 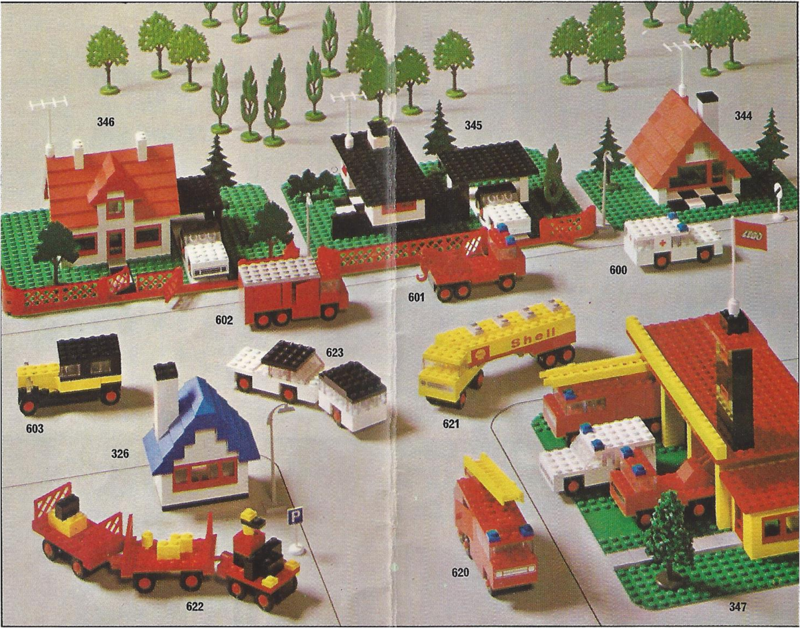 Lego supplied trees but not, at least in 1970, people. This tended to be a Sunday morning activity. While my parents had their lie-in, the early quiet was an ideal time to assume the uninterrupted role of creator of worlds in brilliant plastic (or acrylonitrile butadiene styrene to be precise). One interesting aspect of Lego is that you can’t smash it up, taking the equivalent of a wrecking ball to your creation. You have to pick it apart. As a child who hated throwing hammers at fairground crockery stalls, possibly that lack of destructiveness and a certain meticulous quality appealed. 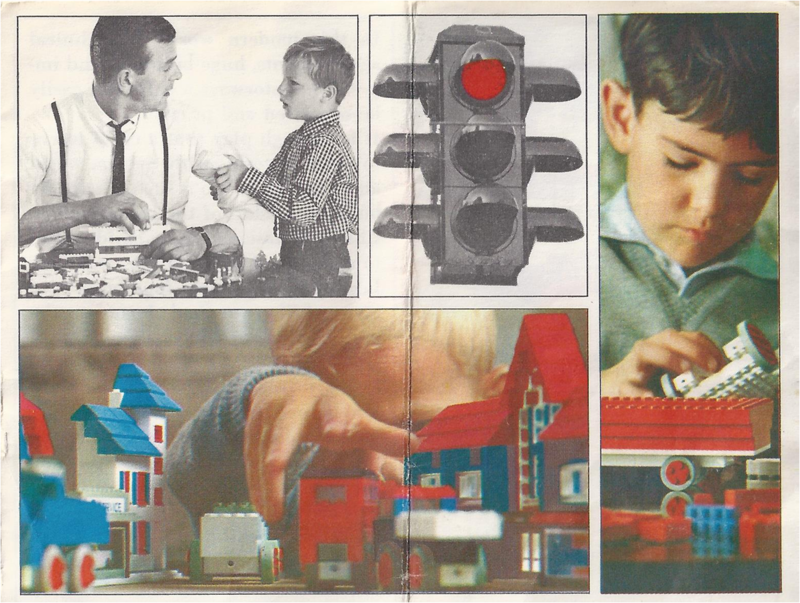 Clearly I couldn’t articulate this at the time, but the feel of Lego wasn’t quite British – was it too well designed? – but nor was it US. 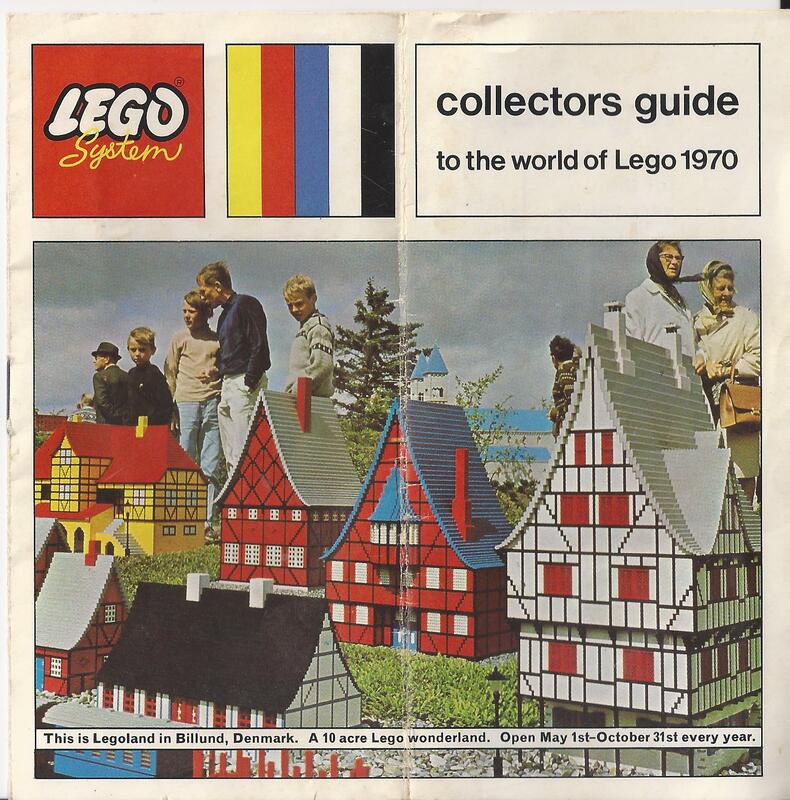 Lego had its own particular aesthetic which perhaps owed something to a European/Nordic, well I might say Icelandic but actually Danish, sensibility. Even that vertical striped logo suggests an idealistic amalgam of Euro flags. There is something inherently progressive about children’s play products emanating from Europe, as if they must possess a nobler aim than simply to entertain. There is no deliberate play at cuteness. Those colourful Cuisenere counting blocks, or ‘rods’ as they were known also come to mind; mine will doubtless turn up at some point. Amongst my collection there are yellow signs bearing the legend ‘Shell’, a blatantly corporate insertion which wouldn’t make it through contemporary radar (you can just make out an upside-down sign in the top picture). The publicity is fascinating. Boldly colourful pictures of clean-cut børn and Startrite graphics strongly evoke the times whilst the text [right] provides glimpses into then current ideas on children’s learning and the wider world. Here we have the dizzying pace of modern change tempered by a note of paternalistic reassurance and a hint at progressive ideals of child centred learning – by 1970 the child had needs which ‘demanded’ to be met. Yet the internationalism of ‘boys and girls throughout the whole world,’ reeks not of global corporatism but of Children’s Hour wide-eyed wonder. In the publicity material, eight out of ten children shown are boys and in the packaging there are typically two boys to every girl. Having languished unused for twenty-five years, it seems criminal to simply close the lid on that toolbox for another twenty-five. Toys are meant for children to play with. I had a slightly self-conscious try myself and found the bricks, smaller now, still slot together in exactly the same satisfying way they did forty-five years ago. 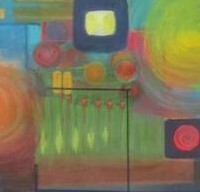 But those grand designs aren’t in my head anymore, nor the nimblenesss in my fingers. So I’ll be taking the box and its contents to a charity shop. Who knows where it will end up for another generation to enjoy?